If you’re reading this, you’re probably thinking about cable alternatives. As more and more people abandon antiquated and expensive ways to watch their favorite shows, sports and movies, you don’t want to be the last overpaying to watch television. But, how can you cut cable and still get everything you want? This is the conundrum many people find themselves in. Yes, the super tech savvy made the leap from cable but for the rest of us, how do we know what will give us all the shows we want, without costing a ton? In this guide, we will look at everything you need to know about the best cable alternatives out there in 2018. Once you understand how you can quickly and easily watch television without cable, you can save serious money by eliminating that old cable bill. You will also be surprised how many options are out there to make watching your favorite shows easier than ever. Live TV streaming services are everywhere. For a small monthly fee you gain access to everything from the best TELEVISION series to recently released movies. While everyone has heard of Netflix, there are several major players in this space that you might want to consider. Roku players and Roku televisions are easy to install devices that give you access to the Roku library. You either plug the Roku player into your TV or plug in your new Roku TV and you are ready to get started. 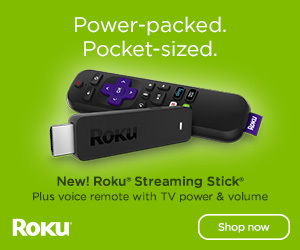 Roku delivers all of your streaming media in one place. If you are a subscriber of Netflix, Amazon Prime or just about any other streaming service, you can access is through the Roku hub. 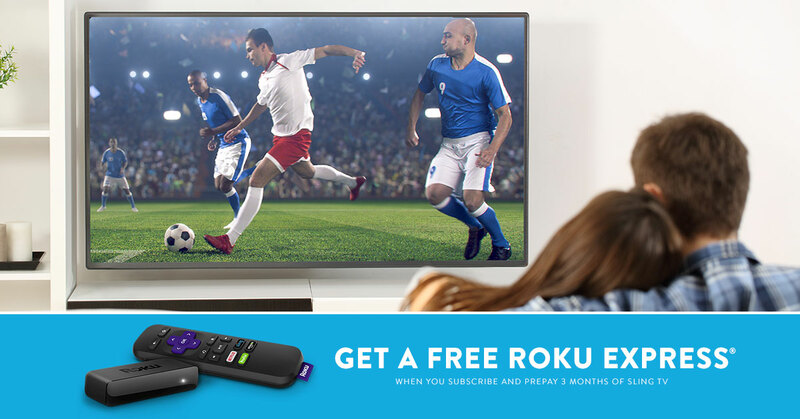 One of the biggest selling features of Roku is that once you buy the player, there is no monthly fee. 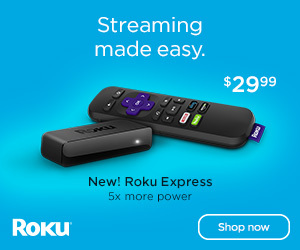 Click here to check out Roku! One of the cool things about Roku is that you don’t have to choose a package or pay a monthly fee. Your Roku TV gives you free access to network channels like ABC and CBS right through your home’s antenna. You have access to over 140 sports channels including NFL, MLB, NHL, NBA, WatchESPN, and FOX Sports GO plus health, fitness and yoga channels. Some are free, and others require a subscription. You can stream both free and paid programming through services like Netflix, Amazon Prime Video, Hulu, Google Play, HBO, SHOWTIME, PBS, and YouTube. You can even access your music subscription to Pandora and Sirius XM through your Roku hub. Sling TV has risen to the top as one of the best live TV streaming services currently available. This is largely due to the fact that you pay for what you watch, and nothing else. You choose the channels you need, and you pay a low monthly fee. You can even add extras like top kid’s networks. Sling lets you choose from a channel list to create a personalized lineup that works for you and your family. You can add options like sports, kid’s programming, comedy and tons more. Starting at $20 a month you can get all the movies and shows you love without the hassle of a contract or endless list of channels you never watch. 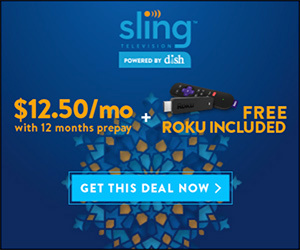 Click here to get Sling TV for FREE for 7 days! You can access the full Sling channel list on their website. Hulu is another major cable alternative, with access to television shows, top movies, and even Hulu exclusive series. You can access your favorite Hulu shows and movies with devices like Mac or PC’s, Apple or Android devices, Roku devices, Amazon Fire, Apple TV, Xbox and several other supported devices. Like Netflix, Hulu also offers Hulu original series that you can’t catch anywhere else. When you sign up for Hulu, there are no hidden fees, no need to rent or buy special equipment and there is no complicated setup. Just register, choose your package and start watching. You can catch your favorite shows on the major networks or you can choose to add on premium channels like HBO, Cinemax or Showtime. A feature that is making some serious commotion is their new feature of watching live TV from any Hulu accessible device. This means sports, news, children’s programming and much more are now as close as your phone or tablet. Click here to check out Hulu today! Stream full seasons of exclusive series, current episodes, classic favorites, Hulu Originals, hit movies, kids shows, and more. You can access the full Hulu channel list on their website. One of the newest ways watch TV without cable or satellite is PlayStation™ Vue. This live streaming TV service comes complete with access to sports, news, and your favorite must-watch shows. Depending upon the package you choose you can enjoy premium channels, a powerful cloud DVR (which you can access at home and on the go), streaming on up to five devices at once, and best of all…no annual contracts! Whether you are a gamer or not, you may want to consider the PlayStation™ Vue as a cable alternative. You do not need to have a PlayStation console in order to take advantage of this streaming service. You can stream from a number of devices and take your favorite TV shows and movies on the go. Tech sites like Wired and CNET are hailing PlayStation™ Vue as a leading cable TV alternative. Click here to check out PlayStation™ Vue today! Access the essential networks, including local broadcast channels and favorite cable networks like AMC, ESPN, HGTV and more. Feature add on channels include: Sports Pack for $10/mo., epix hits for $2.99/mo. and Espanol for $3.99/mo. Includes NFL Network, NBA TV, MLB Network and more regional sports networks. Access to all channel available through PlayStation™ Vue streaming services, including essential networks, local broadcast channels, cable networks, sports, children’s programming and popular movie channels. Includes premium networks HBO® and SHOWTIME® included. You can access the full PlayStation™ Vue channel list on their website. 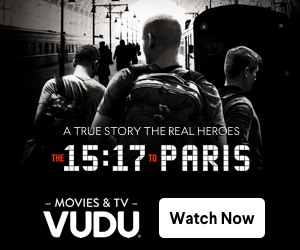 Owned by retail giant Walmart, Vudu is a free streaming service that offers a limited number of movies and TV shows, but the ability to buy movies and shows for a low cost. While they do not yet offer the ability to watch live television, you can rent your favorite network TV shows. If you are looking for sports, news and live TV then Vudu is probably not the live streaming service for you. However, if you are a movie buff or can’t get enough of syndicated TV shows, then you might want to read on. Vudu has a fairly large library of free movies and TV shows. They also have sales and bundles that allow you to get a series of your favorite hit shows for a low cost. 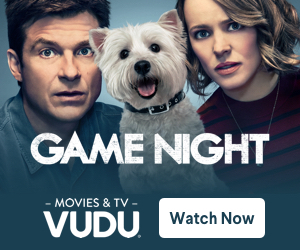 This makes Vudu a competitive cable alternative for anyone who is looking for a free service that sidesteps a monthly contract. While there are no traditional package options, the cost to buy a show is often as low as $1.99. Movies can be purchased for as low as $3.99. For a full list of TV shows available on Vudu, check out their website. Amazon Instant Video has been known to throw newcomers for a loop. Is it available to Amazon Prime Members? Can other people use it? The answer to both questions is yes. Amazon Prime Instant Video: This service is available for free to those Amazon users who pay an annual fee to become an Amazon Prime Member. This all-you-can-stream for free service houses a library of thousands of movies and TV shows ranging all the way from documentaries to children’s programming. Amazon Instant Video: This service is a pay-as-you go streaming service and is not a part of the Amazon Prime subscription. Because you pay per show or movie, the library of offerings is much more updated. While Amazon Prime Video is not technically free (it is part of the paid Amazon Prime Service), it is a nice addition for those who pay for the luxury of free two-day shipping. You can stream shows and movies from a wide range of devices. Because these is no monthly contract or fee for Amazon Instant Video you only pay for what you need, and nothing extra. The only decision to make here is whether you want to rent or buy from the more updates Amazon Instant Video library or take advantage of the free shows and movies through Amazon Prime Instant Video. Check out the full list of Amazon Shows and Movies on their website. A new face to the world of streaming television is YouTube TV. You can now access live TV from more than 50 networks, including local sports and news with no extra equipment. You probably already use You Tube on a fairly regular basis, now you can use it to stream TV. With your subscription you get 6 individual accounts, so each family member can customize their login. You also get cloud DVR storage with no storage limits. There is currently one package available for YouTube TV. For a full list of TV shows available on YouTube TV, check out their website. We obviously could not end the list of top free streaming services without a nod to the OG of subscription television – Netflix. Netflix pioneered the TV and movie subscription industry in 1997 offering a mail away rental service for movie rentals. You paid your small monthly fee and Netflix would mail you a copy of your preferred movie. Over twenty years later and Netflix is still leading the way. Unlimited movies and shows, watch on just about any device, cancel with no fee and try it free for a month. Another popular cable TV alternative for those who want to ditch cable is to install a satellite. Satellite TV became popular in the 1960’s and 70’s, giving people access to TV who were limited based on where they lived. Since then satellite has grown in popularity as an alternative to cable. According to a study conducted by Statista the number of people living in households that have a satellite TV subscription (in the US) from spring 2008 to spring 2017 was approximately 61.5 million. The biggest supplier of satellite TV is Direct TV, with access to hundreds of channels, sports packages and free DVR and low monthly costs. You can choose a package starting at just $40/mo. For an added monthly cost you can add premium channels like HBO and Showtime, NFL Sunday ticket or various international packages. DISH is another fan favorite when it comes to top satellite TV connection providers in America. DISH is known for its affordable packages designed for people who love movies, sports and TV shows. More recently introduced and somewhat similar to satellite TV options are HDTV antennas. Think back to those old bunny ears on top of your TV set. Now, fast forward thirty years and we meet the distant cousin of the set top box bunny ears. HD antennas can pick up programming from popular networks like ABC, CBS, NBC and FOX, as well as a number of others depending upon your region. They come in many shapes and sizes depending on the manufacturer you choose. You can buy an indoor or outdoor antenna, with indoor being lower in cost and easier to install. If you live in a more remote area, an outdoor HDTV antenna might be necessary to pick up the channels you prefer. Just be sure to choose an antenna that has been outlined as a top performer to be sure you get access to the channels you want. One group of people who have long held-out in cutting their cable are die-hard sports fans. With blackouts, special cable networks just for sports and a number of other reasons, sports fans fear losing cable will cost them access to the big games. There are now several streaming services with the sports fan in mind. FuboTV is an internet television service that focuses primarily on channels that distribute live sports, including NFL, MLB, NBA, MLS and international soccer. In addition to getting your daily sports fix, you can also access news, network television series and movies. You can try FuboTV for a free week and the first month pay just $19.99. If you want to continue subscribing the cost is then $44.99/mo. Another popular option for sports lovers is a service we have already reviewed. Sling TV’s Blue plan is just $25/mo and gives viewers access to network TV and plenty of streaming sports. This is a low-cost option that makes sure you don’t miss out on your favorite sports broadcasting. If you are looking for access to local sports, than You Tube TV is a great option. As part of your $40/mo. package you can watch all of the local sports you like, while also accessing over 50 additional networks. Pluto TV is a free internet service that give viewers a way to catch some of their favorite shows, movies and sports. For sports fans you can watch several broadcasts, including Pluto TV’s own sports channel. You can check out their channel lineup on their website. Many sport lovers already know that Fox Sports is a treasure trove of free streaming shows and broadcasts. You can even customize with your team favorites AND your team rivals for a customized viewing experience. You can now access a limited number of shows for free right from the networks website. Big networks like ABC, CBS, NBC and Fox allow you to watch shows on their website for free. You benefit from free streaming shows and they network can boost viewership on their network shows. While what you can access is somewhat limited by the networks, you can still watch some of your favorite shows for free. In reality when you start making decisions about the right cable alternatives for your needs, chances are you will mix and match a few options. It’s rare for one streaming service to be a perfect fit, but perhaps combing two or three gives you the right mix. What’s important is that there are cost-effective options available that can save you money and give you the ability to take your shows, movies, sports and news on the go. What are my must watch shows, movies, sports and news? Do I need to take my shows on the go? When you answer these simple questions, you will start to see which cable TV alternatives are the ones for you. Bottom Line: Experts have found that the average American spends over $100 each month on cable TV. With so many low-cost and free options, now is the perfect time to look for cable alternatives that can save you money and make your TV watching experience easier than ever. Thanks so much for this information! You are so right! Right now is a great time to find alternatives to cable or satellite! Many great offers out there! Thanks for sharing!